Schnuppe von Gwinner, The History of the Patchwork Quilt: Origins, Traditions and Symbols of a Textile Art (West Chester, PA: Schiffer Publications, 1988). Kathryn Berenson, “Tales from the ‘Coilte,’” V & A Online Journal (Autumn, 2009). Kathryn Berenson, Marseille: The Cradle of White Corded Quilting (Lincoln, NE: International Quilt Study Center & Museum, 2010). “Quilts, Patchwork, and Quilting,” Victoria & Albert Museum. Quilt Museum & Gallery, York, U.K. Sometimes, people think that quilts are solely an American phenomenon. While it’s true that American quiltmakers have developed their own styles and approaches over the years, many quiltmaking traditions derive from European sources, particularly Britain and France. Mosaic patchwork quilts, for instance, are a distinctly British style that enjoyed popularity on both sides of the Atlantic (see examples in the image carousel). French white corded quilting also influenced American quiltmaking practices (see a c. 1680-1700 quilt from Provence, France in the image carousel). And beyond the U.S., U.K. and France, quilts have been made all over the world for centuries. The earliest quilted textiles in existence include a Mongolian quilted floor covering from around the 1st century CE (a fragment of which can be seen in this article) and three quilted panels made in Sicily in the late 1300s, one of which is in the collection of the Victoria & Albert Museum in London. Other early examples include the circa 1600 whole cloth quilt included in the image carousel, probably from the Mediterranean region. 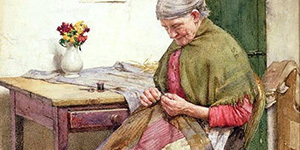 Quilts are also made outside of the Western world. The Indian subcontinent has a particularly rich history of quilted bedcoverings, from kantha in the east to ralli in the west. Quilted clothing is common to many parts of the world, including the Middle East and China. And patchwork, so integral to our understanding of quilts, has long been made in places like Central Asia and the Korean peninsula, where pojagi wrapping cloths are considered an artform. The American quilt story is truly part of a much larger World of Quilts.